One of the traditions in American housing that Frank Lloyd Wright sought to change was the abrupt difference between the exterior -- brick, clapboard, stucco -- and the interior -- wallpaper, wood paneling, or painted plaster. 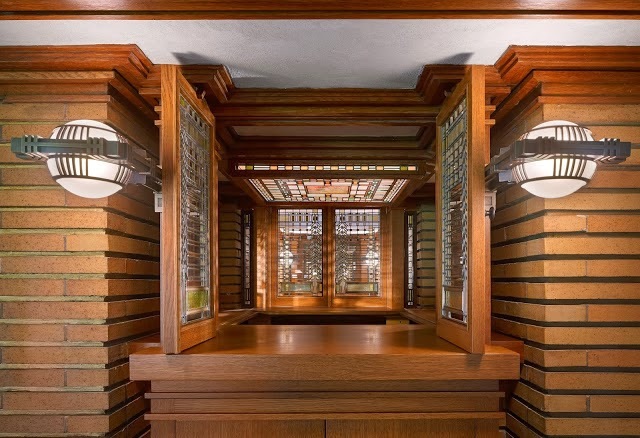 The Darwin Martin house is a particularly good example of the way that Wright made the interior and the exterior continuous. The first image (fig. 1) was taken in the dining room looking outward to the north. The Roman brick pier travels five feet within the interior and then four more feet beyond. In fact the Roman brick exterior of the house is continued throughout the house on the ground floor. Wright further enhanced the inside-outside continuity by repeated certain motifs within and without. For instance, on the front facade of the George Barton House (fig. 2) a Roman brick extrusion serves as a flower box above which there are three windows, a large clear pane flanked by two narrow art glass windows. Inside the house in the dining room this motif is repeated (fig. 3) in the form of the oak buffet above which is a large mirror flanked by two art glass doors. These reiterated themes bear out Wright's promise to the Martins that he would give them "a domestic symphony."